I took a few hours tonight and had another speed doodling session. I worked from my imagination with this one, with a goal set to as fast as possible get a decent looking character. I really need to get a speedy workflow in modeling characters for some of my upcoming projects, so I’ll probably make a few more similar doodles around this theme. The image above was created from scratch from the first polygon to final render in about 3-4 hours. This was mainly a ZBrush project, but I did end up rendering it out in LightWave 3D at the end. If I had spend some time on bulding a skin node network in LightWave and worked a bit on the hair it would probably have ended up pretty decent looking, but I’m saving that for the next time. Anyway, I started this project by making a few ZSpheres and sculpted and pushed around the mesh from there, going up in level of detail now and then, trying to capture the basics of the female facial form as much as possible. 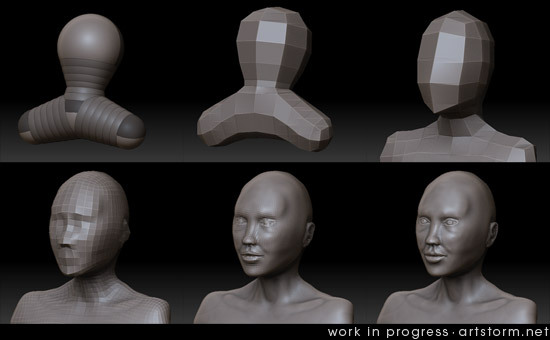 Check out the image below for a few screenshots from different times in my sculpting process. At this stage I felt I had got most of the structure down as I wanted it. As sculpting from a few ZSpheres in ZBrush doesn’t create a decent topology, I included fixing the topology to my workflow this time. To fix that, I roughly painted out directly on my character how I wanted the topology to flow, somewhat close to what I like, and then I used that model with my paintover as a template, building my new topology on top of that. When I had my new topology in place, I projected my sculpted details back into the new mesh. Here is three additional screenshots; The original topology – My paintover – The final topology. Alright, the third one looks much better, so to end this session I made some basic texture painting as well. I didn’t bother with painting any Subsurface Scattering, Specular, Diffuse maps and so on this time, I just wanted to get some texture down and painted a simple color map. 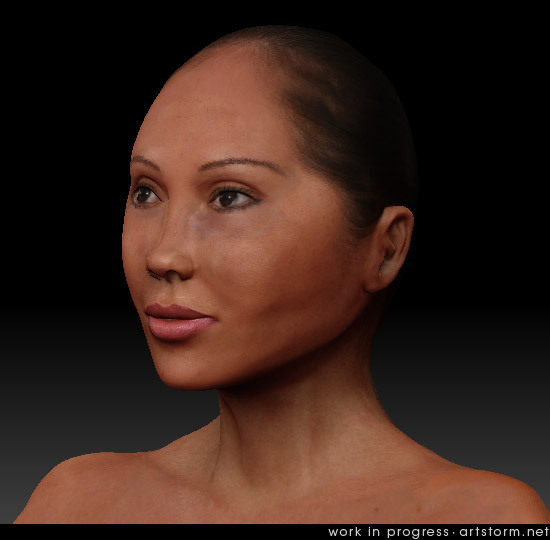 Here is the color map rendered in ZBrush with a basic skin shader applied. And to close out this doodling session, just for fun, I exported the model out of ZBrush and brought her into LightWave. I made a quick and dirty wig with some hair strands, just a few minutes worth of work, and then rendered out the image at the top of this post. Well, that’s it for this time. I shall return.